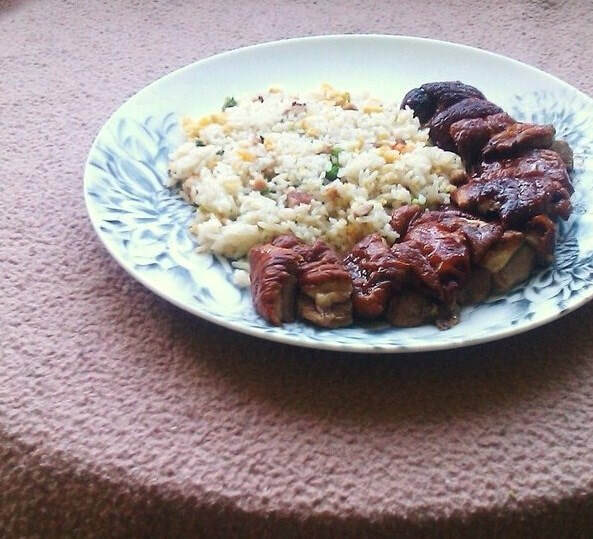 Arroz con Pato which in English means rice with duck, is an official Peruvian dish. There are many variations of this dish. I have made it to my taste specification, and my version more closely resembles a typical Latin Caribbean Arroz con Pollo, popular in Peru, and throughout Latin America. However, the only real difference between my version and the original version, is that I've made rice typically served with arroz con pollo-meaning yellow rice. Green rice flavoured with cilantro is the rice often made to go with this dish; though not always, and the dish has many variations. The dish is served with green peas as I have done. I can say with absolute certainty that this dish was delicious. But then, so are many dishes that I make, and I often confuse myself with deliciousness. You can use chicken as an alternative if you wish. I am currently really enjoying the flavours, colours, and textures of Latin American food. It's great food for the summer, because the colours are so vibrant and summery. Cuban, Puerto Rican and Peruvian rank among my favourites. I also love Colombian, Mexican, and many others. Measure 3 cups of rice in a measuring jug. Set Aside. Add quarter of a cup of Annatto Oil to a pot and heat up. Alternatively you can add powdered annatto to oil if you prefer. Once the oil is hot add the rice and mix the rice into the oil so it is coated with the annatto for at least three minutes. Now add five cups of water and bring to a boil on high heat. Add a chicken stock cube and salt to taste, I add a minimum of 1 and a half teaspoons of salt, it tends to be less salt when I add a chicken stock cube. Boil for eight to ten minutes then turn to a very low simmer. Add frozen garden peas in the last ten minutes, ensuring there is enough liquid left for them to cook. Have 1 diced onion, 1 red bell pepper diced, 1 garlic bulb peeled and diced, set aside. This will be the Sofrito and base of the dish. 1. Season the Duck Legs with a teaspoon of salt, 2 tbs of light soy sauce, and sprinkle them with half a teaspoon of cumin- double this quantity if you are using more than four duck legs, or at your discretion. But, I would never use more than a teaspoon of cumin for seasoning the legs. Set Aside. 2. Once sizzling, place the ducks in the pan skin side down. Brown the meat on both sides- for approximately three to five minutes on medium to high heat. Then remove the ducks from the pan and add the sofrito; the onion, bell pepper, and garlic. Saute the sofrito for about three to five minutes. 3. Add the duck legs back into the pan and stir together with the Sofrito. Add about 2 tbs of Annatto or Achiote oil. Add more chopped garlic and sprinkle in about a teaspoon more salt. Then add 2 cups of water and bring to a boil on high heat. Add a chicken stock cube, (TELMA) is my choice, and add an onion peeled but not chopped. Boil for about ten minutes. 4. After ten minutes, turn to a low simmer and cook the duck legs for approximately forty minutes to an hour, or more if needed. Check for salt and flavour, add more salt/and or black pepper to taste if necessary. Add about a tablespoon of dried cilantro leaves about half way through. Stir the pot when necessary. Make sure the duck legs are fully cooked through.